In a career as a professional musician that lasted roughly 65 years give or take a week or two, it’s inevitable that certain periods of an artist’s output during that time might get somewhat overlooked, even if that artist is one of the true legends in American popular music. Though the hit-making career of Johnny Otis lasted just over a decade, the tail end of the 1940’s to the dawn of the 1960’s with a late 60’s hit thrown in for good measure, his presence on the national music scene was constant in one way or another for half a century. 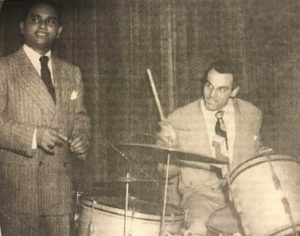 From his first appearances as a drummer on the major hits of others starting in 1945 to his own induction into The Rock ‘n’ Roll Hall Of Fame in 1994, by which time he was a revered elder spokesman for the musical styles which formed the bedrock of 20th Century black American culture, Johnny Otis seemed to hover over the musical landscape for an eternity. (Coincidentally his son Shuggie, an acclaimed guitarist who had a brief flurry of notoriety on his own in the 1970’s just released his first studio project, Inter-Fusion in four decades just a week or so before this review was published). Yet while his first ventures into a studio – both behind others as a sideman, notably playing drums on the huge hit Driftin’ Blues by Johnny Moore’s Three Blazers (making Otis the fourth Blazer I suppose), and as the leader on the regional noisemaker Harlem Nocturne, a moody piece he tossed off in the final minutes of the session – have been fairly well documented, the stories tend to skip over the period we’re in now as he progressed artistically, jumping instead to his run of huge hits on Savoy starting at the tail end of 1949. But here’s perhaps where we can learn the most about Johnny Otis’s rapid career evolution as he struggles to adapt his own strong artistic visions to a more commercial mindset. The two entities are not always compatible as we know all too well and when one fights against the other in the heart of the creators the results are understandably going to suffer. But for those, like Otis, who was learning when to give a little and when to take a little from each realm in order to find a happy medium, the balancing act between the two would soon pay off. Thus in many ways it’s the false starts and tentative experiments during this brief and seemingly uneventful stretch of his career where he got his footing and would emerge from with a firm sense of direction which would soon launch him into the stratosphere. It’s important to remember the environment Johnny Otis was coming out of as he moved into the next stage of his career, that of a recording artist rather than a club performer. Unlike most musicians we’ve met who had more upscale backgrounds in nightclubs that were catering to higher end patrons, Otis was unapologetically low-brow. That’s definitely NOT an insult, but rather an important designation to make to establish the unique realm he represented at this stage of the game. Otis’s Barrelhouse Club in Watts was the first of its kind, at least the first to achieve any recognition, for specializing in rock music rather than the loftier pursuits of jazz. While he had an abiding love of big band jazz that he otherwise might’ve pursued in other circumstances he was smart enough to see the musical and cultural changes coming and to hear the reaction of the club-goers who craved an earthier brand of musical madness. For this decision Otis said he was seen as a traitor by some established jazz musicians. But it wasn’t so much an elitist vs. commoner struggle for the musical soul of black America as it was a generational one. The audience coming of age in the late 1940’s needed its own music made by its own stars which focused on its own experiences and highlighted its own vibrant culture. So Johnny Otis gave that experience to them each night in unambiguous terms, featuring some of the most explosive rock instrumentalists yet heard on the scene in ahead-of-his-time guitarist Pete Lewis and the revolutionary Big Jay McNeely on sax. But while those guys packed the biggest wallop on stage that brand of musical anarchy was best served in a live venue as a way to close out a set, their outrageous playing raising the rafters and leaving an indelible memory behind that would entice people into coming back – after the break or the next night or following weekend – to hear more of the same. Yet it couldn’t be ALL they did, otherwise it’d be hard to move around the floor with all of the carcasses strewn about after hours of playing in such unbridled fashion caused dozens of people to drop dead of heart attacks. So the rest of the show was given over to different types of presentations that had deep roots in black culture. They might incorporate some jazzier sides as a nod to the recent past and to indulge in Otis’s fondness for that type of music, but then they’d throw in some ballads and bluesy material to go along with it to keep it balanced out. Finally, in order to forge a deeper more personal connection with the crowds along the way, they’d top it off with a healthy dollop of racy humor. During the heyday of black cultural venues as a specific world unto itself of the 1930’s through the early 1960’s, a time when entry into mainstream outlets was extremely limited for performers of color, humor played a sizable role on the so-called chitlin circuit. It was there that comedians (as well as dancers) toured alongside jazz bands, blues acts and now rock artists as well, performing on the same stages during these incredibly diverse multi-performer shows. Unlike music where ever-changing trends sent certain styles and artists up and then back down the bill, destined to be replaced once their brand of song was no longer commercially viable, the comedians rolled on unaffected by the passing years. Legendary teams such as Butterbeans and Susie, or solo stars like Dewey “Pigmeat” Markham and Moms Mabley, did their routines night after night, stop after stop, for decades on end. The humor was crude at times but the laughs were derived from elemental truths coming from within the black community itself and provided audiences whose own lives were more of a struggle than a bed of roses a chance to find some humor in their situation and at the same time to derisively comment on the oppression and unending obstacles society threw in your path to thwart your upward mobility. But whether that approach works on a cold piece of wax, something which by design is going to be listened to without the communal response that humor needs to thrive, is another question entirely. Questionable is more like it. Rock ‘n’ roll has been around for seven decades as of this writing and the hits rock has scored in that time number in the tens of thousands but the total number of enduring classics built primarily around humor, where actual laughs while listening was the primary intent of the artist, are so few as to be almost inconsequential. In other words if you’re playing a music record in order to be comically amused your chances are mighty slim at seeing that goal reached. If you’re an artist hoping for that response, let’s just say you better have a backup plan at the ready. If anyone had the arsenal of musicians at his disposal to serve as a backup plan on Pay Day Blues it was surely Johnny Otis. Cathy Cooper was the resident singer/comedienne at the Barrelhouse Club who parlayed that into a brief career on record fronting the stabs at humor on Otis’s early records. We heard her for the first time last winter on Alimony Boogie, a record whose theme really serves as a sequel to this one, so it’s a shame they didn’t get released in the order that would’ve made more sense as a continuing story. But it’s doubtful enough people heard either one to feel deprived over the sequence of releases so it hardly matters in the big scheme of things. Cooper for her part sounds better than she did last time, although maybe that’s just because we’ve grown accustomed to her throaty contralto that manages to keep the comedic tone in her singing that she also uses for spoken lines. In any event she’s a proficient actress and her timing and delivery are very good for the most part. Unfortunately the jokes she’s delivering on Pay Day Blues are not so well-formed which shifts even more of the responsibility to connect back on the musicians. The piano of Devonia Williams kicks this off with a light touch designed to suggest the impending antics. It’s a stage show accompaniment at heart, a vaudeville backing, or if you want to go even further back something they might’ve used when silent movies had an in-house pianist to provide accompaniment before recorded sound was used. You admire the idea more than effect it has because following that you have the spoken intro by Bardu Ali (Johnny Otis’s partner in The Barrelhouse Club and the man who propelled Ella Fitzgerald to fame in Chick Webb’s band), playing the no-good husband and Cooper as his take-no-gruff wife who clearly holds her own in this nightly tenement scene. Ali’s role is that of a typical ne’er-do-well roustabout without much to show for his big talk and Cooper’s complaints center around his failure to provide for her, particularly zeroing in on his pitiful excuses for his lack of household funds as she states bluntly that each week he comes in “with a brand new pack of lies”. You don’t exactly envision Ali as the industrious sort, do you? He’s clearly somebody lacking in the skills to stay steadily employed or the motivation to change that. He probably takes some small day-labor jobs, just enough to get by, but not enough to ever do so with any breathing room when it comes to getting ahead. By the sounds of it Cooper is the one who controls the purse strings in this relationship, squeezing every nickel until it bleeds just to keep a roof over their heads and food on the table. The situation therefore is true to life – all TOO true for some in the listening audience – and as such it’s one they’ll relate to and probably get a few laughs out of. But in what setting? Listening to this record at home on a second hand Victrola where the mice scurrying along the baseboard all eat better than they do? Probably not. This is a skit that demands others around you to share in the joke… others no doubt who are in the same predicament, each one silently thinking to themselves that they have it just a little bit better than their equally destitute friends, making them all feel the real laugh is on their neighbors rather than themselves. I suppose it’d work in that setting, though frankly I wouldn’t want to be broke enough to know for sure, but on a record they need to bolster it with enough solid music to make you forget your lot in life should you be listening to this alone. That’s where Pay Day Blues comes up a dollar short. The arrangement is centered on piano and horns but it’s the latter – again the wretched trumpet – which add little to the sound. When Big Jay McNeely comes in, who unlike the others sounds like he’s at least had a full meal lately, things pick up, but he’s gone faster than the last piece of bologna in the icebox and thus it reverts back to being just a series of stop-time set-ups for each successive joke delivered by an increasingly scornful Cooper. We can reasonably predict what will ensue before we even hear it… She threatens to leave him, he then threatens murder… (murder??? Yes, murder! ), but it’s harmless enough because by now we know he’s got no more intention of following through on it than he has of heading down to the employment agency and getting a full-time job. The jokes are now veering more towards snide put-downs than humorous exchanges and while the two leads inhabit the roles well enough we’re not getting the requisite laughs to find their problems entertaining, nor are we getting any real musical jolt to let us forget their troubles and groove along with the band. But all of this was necessary for them to try I suppose just to see if they could replicate on wax the spirit of the live venues they knew so well. When it became clear that they couldn’t that’s when Otis eased them out of the ensemble – maybe they stuck around at the Barrelhouse Club where this went over better – and focused instead on finding more typical singers to deliver more appropriate songs. Yet while Pay Day Blues certainly can’t be recommended as a record, it IS nice to at least hear as one of the few examples of a comedic sketch from the late 1940’s club scene in black America that otherwise would exist only in a handful of (probably secondhand) written accounts. Since one of the points of looking back at rock’s journey is to ensure that its full history doesn’t vanish completely, this is a record that needs to be heard if only to understand where the figures in this world we’re encountering were coming from before we put it back on the shelf and move on to something a little more lasting. 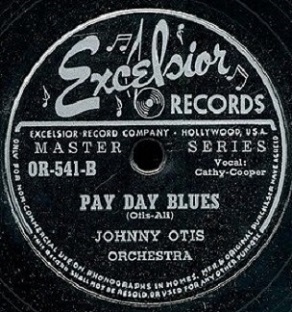 Leave a reply on "Johnny Otis: “Pay Day Blues”"